Teacher Angela Riordan created this interesting hands-on lab activity that demonstrates how properties of substances can be used for identification and classification. Students test samples of different solids and then determine whether they are ionic, molecular or metallic solids from their physical properties such as hardness, melting point, solubility in polar and non-polar solvents, and electrical conductivity. 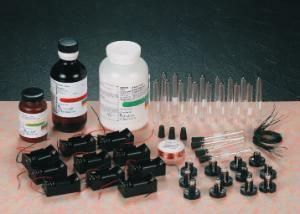 Ordering information: A conductivity indicator is required, but not included.